Nathan’s Eel and Pie Shop in Barking Road. Old east enders eulogise about “Pie and Mash”, which is effectively a meat pie, potatoes and some strange green sauce called “Liquor” a watery parsley sauce – and not some by-product of eels. It’s comfort food par excellence and great if you’ve got a hangover. Nathan’s is a goal-kick away from the stadium. “The Hammer” match programme circa 1974. Small, compact, tidy, straight to the point and incredibly consistent. Edited by Jack Hellier. One of the best around for some years, and handy for the back pocket. Two for one in the South Bank. The wily old gateman who would ask for 1 ½ times the admission if two of you squeezed through the turnstile at the same time. The first occasion it happened to me, I was caught unawares and ended up paying the full amount but still wedged in with a pal. I remember the gateman’s response: “Pillock”. “Bubbles” before kick-off. “Ladies and gentlemen, it’s bubbles time.” Even if you were not a West Ham fan, you sung it. It was community singing at its best. Close to the action. If you stood behind the goal, you were almost breathing on the back of the goalkeeper’s neck. No matter how bad West Ham were, the atmosphere at the Boleyn was always raucous. There were parts of the ground that were no-go areas if you were a visiting fan – I remember standing in the Chicken Run and cheering when Chelsea went 1-0 up, only to be clumped on the back of the head by a local. I kept quiet for the rest of the game. Equally, walking back to the hopelessly inadequate Upton Park station was often precarious if you were not a West Ham fan. After Stamford Bridge, West Ham is the ground I’ve visited the most. If I hadn’t supported Chelsea from a young age, I would no doubt been a Hammers’ fan. I’m glad I made a last visit to the place, but I also think the Olympic Stadium will launch an exciting era for the club. 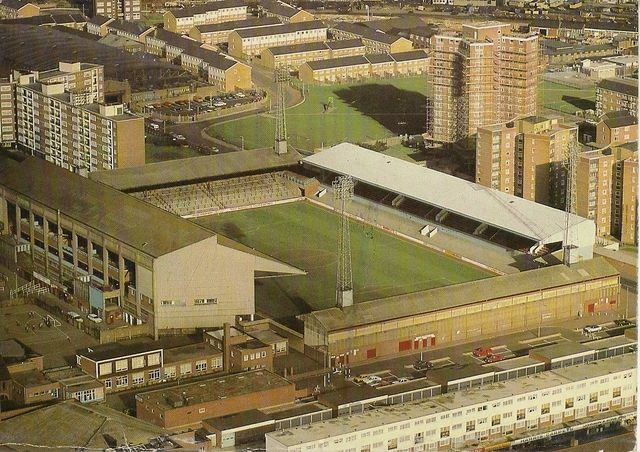 Upton Park always reminded me of something from the inter-war years. Hopelessly romantic and hopelessly out of date…. a bit like the fans aspirations. However, a new optimism reeks from those condemned rafters, and it is certainly nothing to do with the move to a souless, underwhelming and horribly flawed arena that they have been ‘given’.